Hm, I just tried to remember how we actually came up with this cool idea... but it's already too blurred and it doesn't really matter after all. 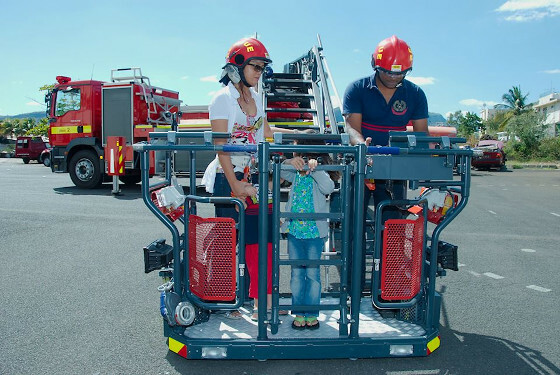 Anyway, if I remember correctly (IIRC), it happened during one of the Linux meetups at Mugg & Bean, Bagatelle where Ajay and I brought our children along and we had a brief conversation about how cool it would be to check out one of the fire stations here in Mauritius. 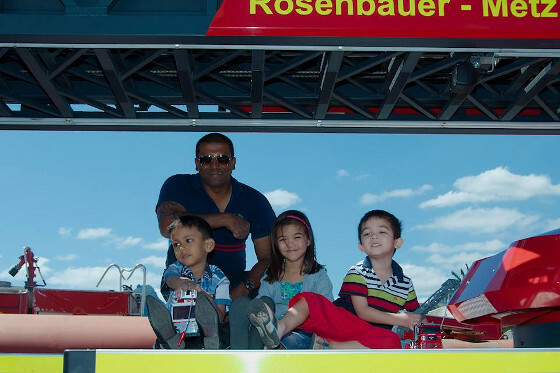 We both thought that it would be a great experience and adventure for the little ones. And there we go, down the usual routine these... having an idea, checking out the options and discussing who's doing what. Except this time, it was all up to Ajay, and he did a fantastic job. End of August, he told me that he got in touch with one of his friends which actually works as a fire fighter at the station in Coromandel and that there could be an option to come and visit them (soon). A couple of days later - Confirmed! Be there, and in time... What time? Anyway, doesn't really matter... Everything was settled and arranged. I asked the kids on Friday afternoon if they might be interested to see the fire engines and what a fire fighter is doing. Of course, they were all in! Getting up early on Sunday morning isn't really a regular exercise for all of us but everything went smooth and after a short breakfast it was time to leave. Where are we going? Are we there yet? Now, we are in Bambous. Why do you go this way? The kids were so much into it. Absolutely amazing to see their excitement. Well, we went through the sugar cane fields towards Chebel and then down into the industrial zone at Coromandel. Honestly, I had a clue where the fire station is located but having Google Maps in reach that shouldn't be a problem in case that we might get lost. But my worries were washed away when our children guided us... "There! Over there are the fire engines! We have to turn left, dad." - No comment, the kids were right! As we were there a little bit too early, we parked the car and the kids started to explore the area and outskirts of the fire station. Some minutes later, as if we had placed an order a unit of two cars had to go out for an alarm and the kids could witness them leaving as closely as possible. Sirens on and wow!!! Ajay arrived shortly after that and guided us finally inside the station to meet with his pal. The three guys were absolutely well-prepared and showed us around in the hall, explaining that there two units out at the moment. But the ladder truck (with max. 32m expandable height) was still around we all got a great insight into the technique and equipment on the vehicle. 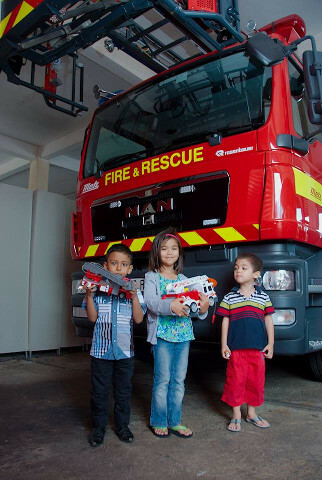 It was amazing to see all three kids listening to Mambo as give some figures about the truck and how the fire fighters are actually it. Absolutely fantastic that the children were allowed to experience this - we had so much fun! 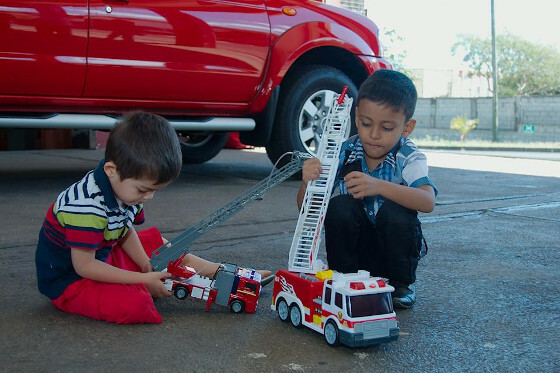 Ajay's son brought two of his toy fire engines along, shared them with ours, and they all played very well together. As a parent it was really amazing to see them at such an ease. 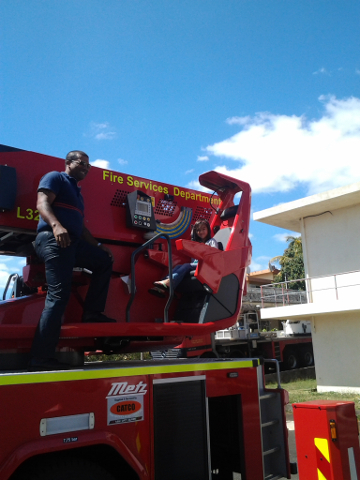 Shortly afterwards the ladder truck was moved outside, got stabilised and ready to go for 'real-life' exercising. 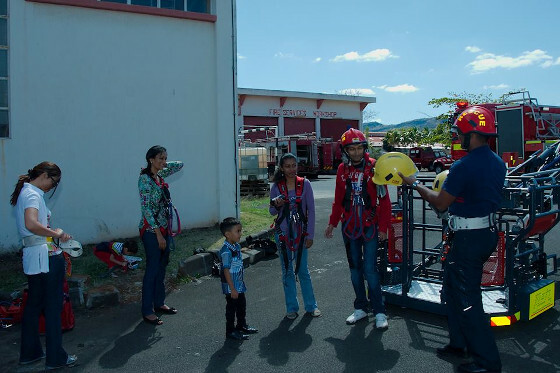 With the additional equipment of safety helmets, security belts and so on, we all got a first-hand impression about how it could be as a fire-fighter. Actually, I was totally amazed by the curiousity and excitement of my BWE. She was really into it and asked lots of interesting questions - in general but also technical. And while our fighters were busy with Ajay and family, I gave her some more details and explanations about the truck, the expandable ladder, the safety cage at the top and other equipment available. ...of course not too high. This is just a demonstration - and 32 meters above ground isn't for everyone. Well, after that it was me that had the asking looks on me, and I finally revealed to the local fire fighters that I was in the auxiliary fire brigade, more precisely in the hazard department, for more than 10 years. 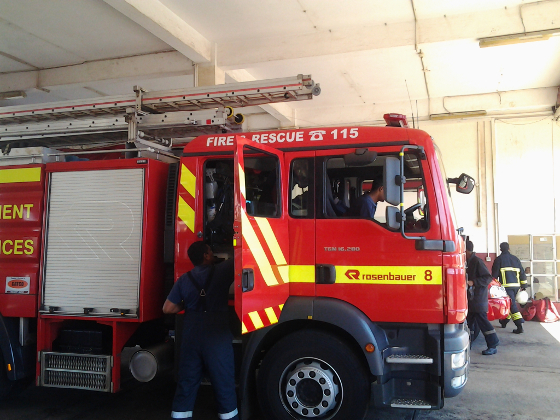 So not a professional fire fighter but at least a passionate and educated one as them. 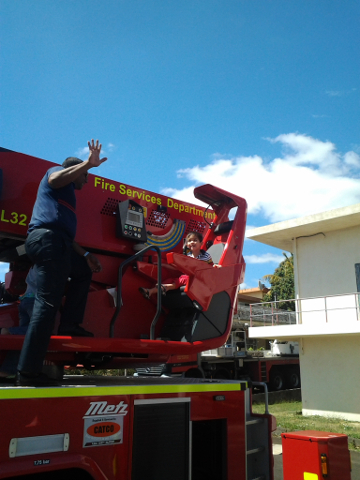 Our fire fighters really took their time to explain their daily job to kids, provided them access to operation seat on the ladder truck and how the truck cabin is actually equipped with the different radios and so on. It was really a great time. Later on we had a brief tour through the building itself, and again all of our questions were answered. We had great fun and started to joke about bits and pieces. 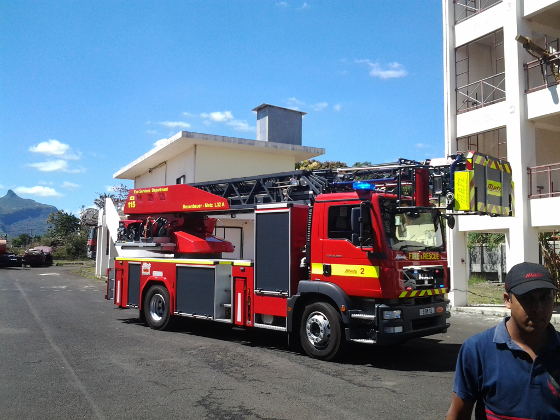 For me it was also very interesting to see the comparison between the fire station here in Mauritius and the ones I have been to back in Germany. Amazing to see them completely captivated in the play - the children had lots of fun! Also, that there are currently ten fire stations all over the island, plus two additional but private ones at the airport and at the harbour. The newest one is actually down in Black River on the west coast because the time from Quatre Bornes takes too long to have any chance of an effective alarm at all. IMHO, a very good decision as time is the most important factor in getting fire incidents under control. 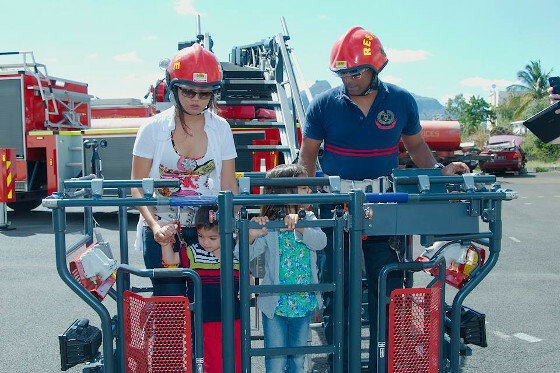 After all it was great experience for all of us, especially for the children to see and understand that their toy trucks are only copies of the real thing and that the job of a (professional) fire fighter is very important in our society. Don't forget that those guys run into the danger zone while you're trying to get away from it as much as possible. Another unit just came back from a grass fire - and shortly after they went out again. No time to rest, too much to do! 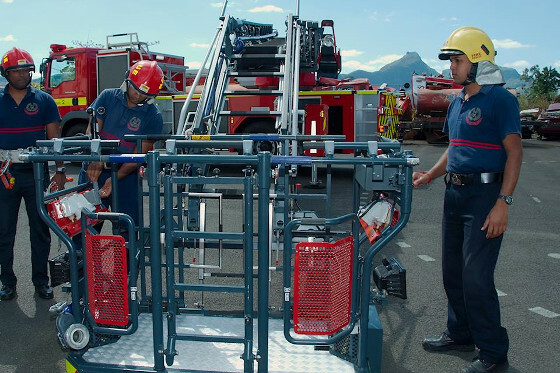 Mauritian Fire Fighters now and (maybe) in the future... Thank you! It was an honour to be around! 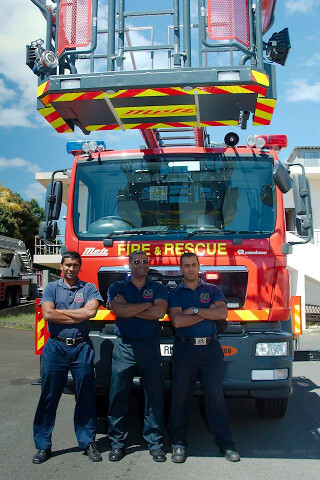 Thank you to Ajay for organising and arranging this Sunday morning event, and of course of Big Thank You to the three guys that took some time off to have us at the Fire Station in Coromandel and guide us through their daily job! And remember to call 115 in case of emergencies!